One of the most important elements of a building is the roof. Its function is the protection from rain, heat, cold, snow, pollutants, dust, solar radiation, etc. But in most cases the roof does not only have a protective function. In some ways, it is a “headdress” of the building, a part of its image. Design and construction of the roof are chosen in full compliance with the functional, operational and regulatory requirements. The basic criterion for successful selection of roofing is the right choice of construction materials. It is advisable to take into account the opinion of professional builders, as well as the results of object examination and calculation of loads. Architectural solution of the roof, its shape and slope significantly limit the range of possible materials for roofing. At the same time, it is a particular roofing material and not an architect that dictates the appropriate shape and slope. For example, a tiled roof will have to be flat. Also it severely restricts the angle of inclination: some shingles are laid only on 25-30º slopes , and some – a little more than 45º. Also taken into account are the climatic characteristics of the region where the building is constructed. After all, it depends on the geographical location of snow load, the force and direction of the wind. Increasing the slope prevents snow and rain seeping through in strong wind, but it increases wind load and material consumption. Application of piece roofing materials has been done for many, many years. Nature and the environment dictated the specific type of material used: palm leaves were used in the tropics, slate in the mountains, wood chips in forest areas. But tiles continue to be the most perfect and versatile roofing material. 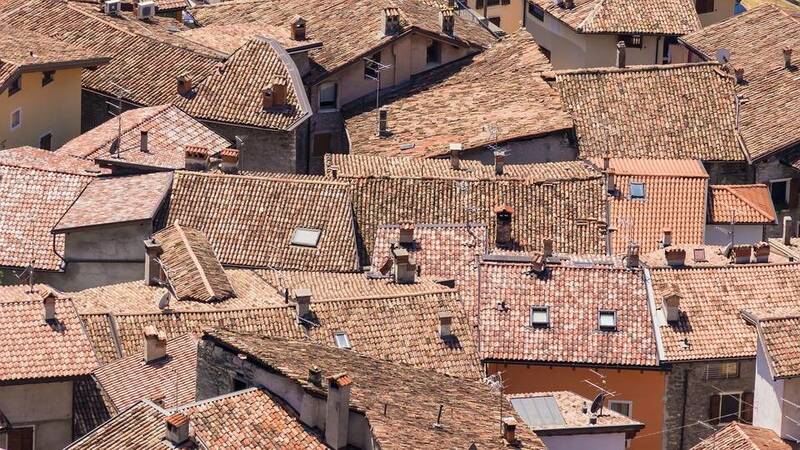 Even today in many cities buildings with tiled roofs remain . When selecting a material for roofing, the deciding factors are prestige and aesthetics. Since the most reliable material is tile, its various modifications began to appear – soft bitumen and metal. These materials are easier to install, have a pattern similar to that of natural slate roofing and are cheaper in cost. Also, the choice of roofing is strongly influenced by traditions of the area. For example, the US and Canada prefer classic shingles (soft bitumen shingles), while Russia and Finland go for metal tiles. In Europe, the latter is extremely rare. In Germany, the proportion of this material does not exceed 3%. The favorite is natural tile in up to 80% of cases, natural slate coming second. Then, each material is given a numerical score on a scale from 0 to 5 based on these criteria. Summing up the numbers and drawing comparisons allows to make an informed decision.